He's talking to Carmelita, so its funny. WHAT DOES THE SLY SAY?! 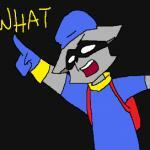 that's sly cooper isn't it?